My favorite thing about Bowl Season is seeing all the crazy match-ups. We’ve had to listen to Navy fans chirp all season about how hard their schedule has been and about how the American ought to be a “Power 6” conference. Now, at last, we can see how true that is. I love the SEC, but they do it, too. When Alabama Coach Nick Saban said after the SEC Championship Game that Georgia deserved to be in the College Football Playoff despite having two losses, his argument rested solely on the idea that the SEC is itself the best conference in college football–by a mile. If you don’t believe that the SEC is that much better than every other conference, Saban’s argument makes no sense at all. He’s trying to get you to throw out the stats and the records and buy into the hype. Bowl Season is the one time of the year in which we can see how these conferences compare on the field. That’s worth a lot given all the noise coming from the conferences themselves. The Celebration Bowl is the championship game for the nation’s historically black colleges and universities (HBCUs). It pits Mid-Eastern Athletic Conference (MEAC) champion NC A&T (9-2, 6-1 MEAC) against Southwestern Athletic Conference champion Alcorn State (9-3, 7-1 SWAC) in the only FCS non-playoff bowl of which I’m aware. I’m not a particular fan of either team, nor do I have a personal tie to any of the nation’s HBCUs, but I love the Celebration Bowl. It’s become one of my annual favorites. The game itself is a little like Army-Navy in the sense that it encompasses a ton of history and tradition that non-fans can’t necessarily appreciate. It’s also usually both entertaining and quite closely contested, though NC A&T has established something of a dynasty here lately. In fact, the Aggies are favored by 7.5-points this year. The Celebration Bowl is Saturday, December 15, at noon Eastern on ABC. There are several reasons why Army fans ought to watch the Camellia Bowl. 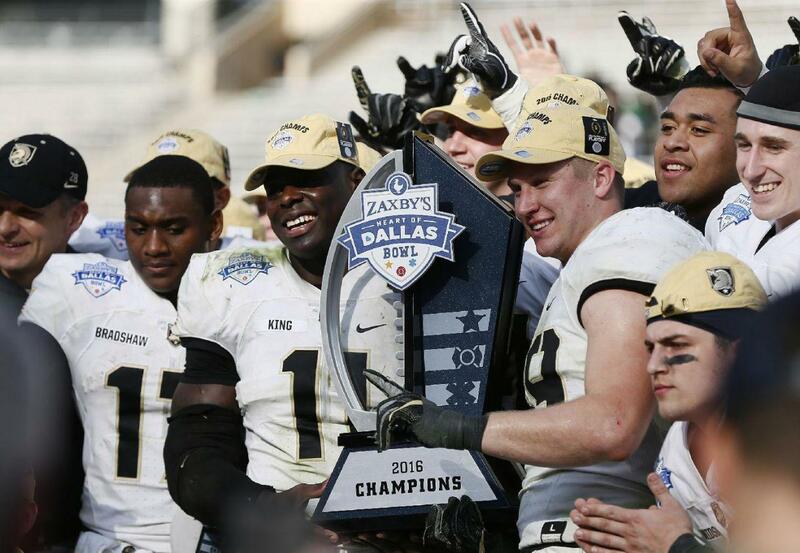 First, Army owns three victories over above-average MAC teams, meaning that every time a MAC team wins a bowl game, it helps Army’s strength-of-schedule argument. Second, Georgia Southern (9-3, 6-2 Sun Belt-East) is Coach Jeff Monken’s old team, and they run a version of the triple-option. Finally, Eastern Michigan (7-5, 5-3 MAC-West) is a pretty good team in its own right, so this ought to be a good game overall. The line is Georgia Southern (-1). With EMU giving up almost 200 yards/game rushing, I’ll take Southern to cover, though that is by no means guaranteed. The game is Saturday, December 15, at 5:30 p.m. Eastern on ESPN. South Florida (7-5, 3-5 AAC-East) has had a disappointing season while Marshall (8-4, 6-2 C-USA-East) did fairly well, though not well enough to knock off Virginia Tech in their final regular season game. The game itself promises to be an interesting contrast of styles, with Marshall playing defense while the Bulls put up their typically gaudy numbers on offense, especially in the running game. The contest is scheduled for Thursday, December 20, at 8 p.m. Eastern on ESPN. Though the line is Marshall (-2.5), I didn’t think the Thundering Herd looked good at all against Virginia Tech. My sense is therefore that the Bulls win handily. This, however, is about as good as it gets for midweek football. Army plays Tulane (6-6, 5-3 in the AAC-West) at Michie Stadium next year in what looks to be the best game on the 2019 home slate. The Green Wave have been on the cusp of bowl eligibility for a while now, but they finally broke through this year, beating Navy in their final game to reach six wins. They also own wins this season over Memphis and South Florida. Despite that success, their offense has been extremely inconsistent. They run a highly explosive version of the triple-option out of a zone-read spread set, but they were boom-or-bust to the point that they just fired their offensive coordinator. It’s therefore a little hard to know what to expect from them in this particular match-up, though it’s a fascinating pairing. On the other side, the Louisiana Ragin’ Cajuns (7-6, 5-3 Sun Belt-West) are probably just happy to be here. They won the Sun Belt-West on tiebreakers over Arkansas State, but no team in the Sun Belt-West is a match for the upper half of the East, which includes App State, Troy, and Georgia Southern. These teams look fairly even on paper, but both teams feature run-first offenses, and Tulane has the better run defense. The line is Green Wave (-3.5), and that’s probably a good bet. The Cure Bowl kicks off at 2:30 pm Eastern on Saturday, December 15. Coverage is on CBS Sports. It's a Bayou Battle for a Cure! We looking forward to welcoming @RaginCajunsFB and @GreenWaveFB to the @citybeautiful! This is the marquee match-up of this first weekend’s action, and if it doesn’t speak to me personally, it’s still one of the few contests in this first week that could directly impact Army’s standing in the AP and Coaches Polls. I hate to root for the Pac-12, but if ASU (7-5, 5-4 Pac-12-South) can pull off the upset, it may well vault the Black Knights into the Top 20. Alas, the Mountain West champion Bulldogs (11-2, 7-1 Mountain West-West) look about equal to the Sun Devils on offense but much, much better on defense. The line is Fresno State (-4). The game is on ABC at 3:30 Eastern on Saturday, December 15. This game pits the MAC Champion Northern Illinois Huskies (8-5, 6-2 MAC-West) against the Conference USA Champion University of Alabama-Birmingham Blazers (10-3, 7-1 C-USA-West), and still it’s been relegated to a Tuesday night. On paper, UAB looks to have both a better offense and a better defense, but both these teams can run the ball, and they can both stop the run, too. That makes this a toss-up, and I just saw NIU smoke MAC worldbeater Buffalo in the MAC Championship Game, so I expect this one to stay close. The line is UAB (-2.5). The game is Tuesday, December 18, at 7 p.m. Eastern on ESPN. DXL Frisco Bowl: San Diego State vs. Ohio. This is a similar deal to the Camellia Bowl. Ohio can get to nine wins with a victory, and they didn’t even play for the MAC championship. Army probably needs them to win. The line is Ohio (-3). The game is on ESPN on Wednesday, December 19, at 8:00 pm Eastern. New Mexico Bowl: North Texas vs. Utah State. Utah State (10-2, 7-1 MW-Mountain) was a machine against the bottom half of the Mountain-West while North Texas (9-3, 5-3 C-USA-West) boasts an elite quarterback in Mason Fine but not quite the same caliber team as the one they fielded in 2017. Still, the Mean Green look to be better on both offense and defense, and as of this writing, they’re favored by 8. Kickoff is Saturday, December 15, at 2 p.m. Eastern on ESPN.